Five models by two builders are now in different phases of construction in the Golf Estates at Old Palm Golf Club. Courchene Development Corporation is building three of the models; Mustapick Estate Homes is building the other two. Courchene is also offering the neighborhoodâs only completed model that is now ready for move inâthe Royal Poinciana. This 4,022-square-feet under-air residence is beautifully situated on a preserve home site that offers the ultimate in privacy. The home is spectacularly designed, beginning with its entry courtyard, which is graced by a fountain that sets a tone of serenity. Inside are four bedrooms, five full baths and one half bath, a den, and a spacious Great Room that opens onto a covered loggia. Other desirable features include high ceilings, beautiful woodwork and a light-infused interior. 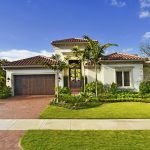 This Royal Poinciana is priced from $1,825,000 unfurnished. Another Royal Poinciana is under construction across the street, a confirmation of this modelâs popularity. Courchene is also building a Carlisle and Poinciana II in the Golf Estates. The 4,062-square-feet under-air Carlisle features four bedrooms, four full baths and one half bath, a formal living room and study. It overlooks a private water feature and is priced from $1,985,000 unfurnished. The Poinciana II offers a Great Room design for its 3,485 square feet under air. There are also three bedrooms, three full baths and one half bath and a study. The Poinciana II overlooks a private water feature and is priced from $1,845,000 unfurnished. Mustapickâs two models are among its most desirable designs. There is the 3,892-square-feet under-air Marseilles, which features three bedrooms, three full baths and one half bath, and a den in a Great Room design. The Marseilles is priced from $1,975,000 unfurnished. Mustapickâs larger model in the Golf Estates is the Monaco. This spectacular 4,098-square-feet under-air residence offers four bedrooms, four full baths and one half bath, a family room and den. Like all of Mustapickâs models, it overlooks a private water feature. The Monaco is priced from $1,975,000.